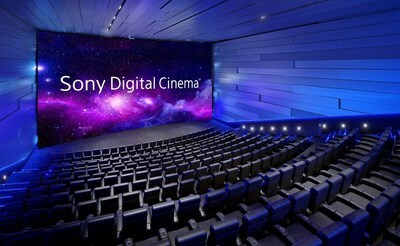 NEW YORK, Feb. 13, 2019 /PRNewswire/ -- Sony Electronics Inc. is introducing Sony Digital Cinema™, the company's experiential premium large-format (PLF) movie theater auditorium. Working in conjunction with state-of-the-art movie theater company, Galaxy Theatres, the world's first location will debut at their Las Vegas Boulevard Mall venue, which is planned to open in spring 2019. Sony Digital Cinema is a new experience for PLF theaters that includes Sony's industry-leading dual laser projection system – which provides exceptional picture quality and immersion – along with powerful sound and luxury reclining seats. The auditoriums' high-contrast projection systems authentically bring filmmakers' stories and vision to life with a vibrancy that matches their original intent. As audiences demand unforgettable theatrical experiences, Sony Digital Cinema auditoriums provide a way to visually and emotionally connect and engage fans with big screen stories. The first location, at Galaxy Theatre's deluxe Boulevard Mall site, will be the largest auditorium in the Las Vegas market, further enhancing Galaxy's distinction as the Best Movie Theater in Las Vegas, according to Las Vegas Weekly and Las Vegas Review-Journal. "This location in Las Vegas is the first in what will be a nationwide rollout of Sony Digital Cinema experiences, which will drive audiences to the movies," said Bob Raposo, head of cinema at Sony Electronics. "Sony has the capability and tools to be involved in every aspect of a film, from capture, workflow and post-production, to film production and distribution, and experiential theater solutions. We are uniquely positioned to understand and develop products that directly impact and elevate cinemas and their audiences." "We strategically chose Las Vegas, a city synonymous with world-class entertainment, for the launch of our new Sony Digital Cinema auditorium at Galaxy Theatres," explained Rafe Cohen, president of Galaxy Theatres. "We strive to exceed customers' expectations of a best-in-class theatrical destination, from the concessions and the seating to the technology. We turned to Sony, a company known for quality and excellence, to create a first of its kind Sony Digital Cinema auditorium that is sure to make our Boulevard Mall location a destination for those seeking the best cinematic experience on every level." For more than a decade, Sony has been working with many of the world's biggest and most prestigious theater chains, as well as small independent circuits and art house cinemas to provide exceptional products, service and support that re-invent the movie-going experience. Robust offerings include 4K, laser, lamp, HDR, 2D and 3D projection technology options. Sony solutions provide the flexibility requested by theaters, and the superb image quality and natural color reproduction that enhances audience engagement. Visit pro.sony/solutions/movie-theatres for more information about Sony's theater capabilities. Sony Electronics' Imaging Productions and Solutions - Americas group develops and manufactures video and audio technologies and solutions for a range of professional applications. These include broadcast television and motion picture production, live event production, ENG/EFP, digital cinematography and more. Sony professional technologies are used in market segments including media solutions, imaging solutions, education, visual simulation and entertainment, theater, healthcare and sports. Visit pro.sony for more information. Galaxy Theatres, LLC (galaxytheatres.com) is known for providing guests with an exceptional cinema experience with friendly service in a comfortable and customer friendly environment. Its Luxury + theatres all offer the proprietary DFX large format screens, laser projection and Dolby Atmos® as well as their famous reclining lounge chairs. Ranked by size in the top 5% of its industry by the National Theatre Association, Galaxy Theatres is widely regarded as one of the most technologically advanced theatre circuits in America. Galaxy Theatres was established in 1998 and is a privately owned, fully integrated movie theatre company. For more information follow us on Twitter (@GalaxyTheatres) and Instagram (@GalaxyTheatres), or like us on Facebook (GalaxyTheatres). Sony Electronics is a subsidiary of Sony Corporation of America and an affiliate of Sony Corporation (Japan), one of the most comprehensive entertainment companies in the world, with a portfolio that encompasses electronics, music, motion pictures, mobile, gaming and financial services. Headquartered in San Diego, California, Sony Electronics is a leader in electronics for the consumer and professional markets. Operations include research and development, engineering, sales, marketing, distribution and customer service. Sony Electronics creates products that innovate and inspire generations, such as the award-winning Alpha Interchangeable Lens Cameras and revolutionary high-resolution audio products. Sony is also a leading manufacturer of end-to-end solutions from 4K professional broadcast and A/V equipment to industry leading 4K Ultra HD TVs. Visit www.sony.com/news for more information.